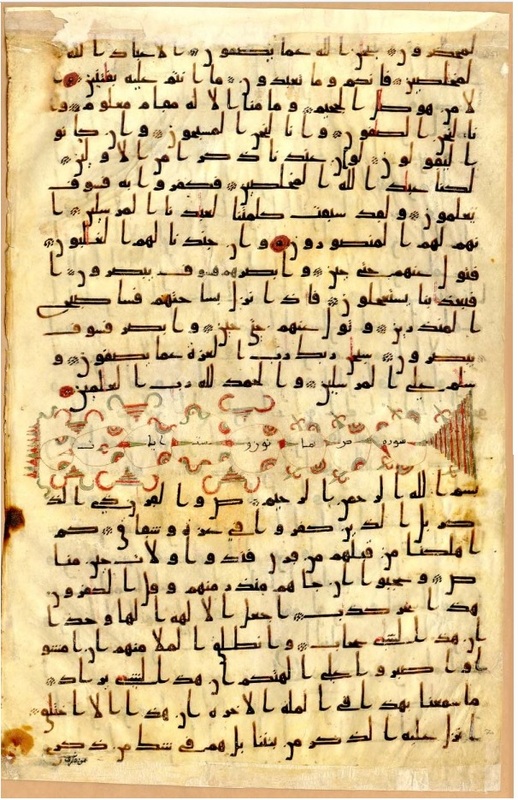 A folio from the "Qur'an of ‘Uthman" (Manuscript E20) at the Institute of Oriental Studies, St. Petersburg, Russia showing the last part of Surah al-Sāffat (verses 158-182) and beginning of Surah Sād (verses 1-8). 2nd century hijra (final quarter of the 8th century CE). The results of radiocarbon dating of this manuscript were published by Efim Rezvan. For this manuscript, a 68.3% confidence level (1σ) yields the dating ranges, 781 CE - 791 CE, 825 CE - 843 CE, 859 CE - 903 CE and 915 CE - 977 CE. The 95.4 % confidence level (2σ) yields 775 CE - 995 CE. Palaeographic analysis of this manuscript gave the date around the final quarter of the 8th century CE. This dating was also agreed by François Déroche. The major portion of this manuscript is at the Institute of Oriental Studies, St. Petersburg, Russia, with smaller number of folios scattered in Katta Langar, Bukhara and Tashkent. Manuscript E 20 at St. Petersburg was bought by the Institute of Oriental Studies in 1936 from an elderly lady who most probably "purchased" it from the library of Irinei Georgievich Nofal, Professor of Arabic and Islamic law at the School of Oriental Languages of the Ministry of Affairs during the second half of the nineteenth century. Nofal was born into a very well-known Arab-Christian family in Tripoli, Syria, and had received a typical Leventine education and spoke French fluently. He divided his time between commerce, representing foreign powers and literary endeavours. The fate of his library, however, is not as remarkable as his upbringing. Nofal's sons were neither interested in scholarship nor literature and consequently they did not make careers for themselves, preferring to live at their father's expense. Gradually reaching a point where, taking advantage of his advanced years, they secretly sold off his library piecemeal to booksellers. After his death, the entire library was disposed off. In June 1998, Efim Rezvan published an article with the detailed description of the manuscript at the Institute of Oriental Studies, St. Petersburg, in the ḥijāzī script. About a year later François Déroche published the Qur'anic fragments at Katta Langar and compared it with the manuscript E 20 at St. Petersburg. Here he positively identified both these manuscripts belonging to the same codex. Déroche also mentioned yet another folio from this codex held in the collection of the Uzbekistan Academy of Sciences, Bīrūnī Institute of Oriental Studies, Tashkent. Later Rezvan identified two more folios from this codex held at the Ibn Sīnā Bukhārā Regional Library, Bukhārā. With this information, Rezvan surmised that this codex of the Qur'an originated from the Greater Syria and Nofal brought it with him from his homeland (Tripoli, Syria). The discovery of other folios at Katta Langar, Bukhārā and Tashkent suggests that this manuscript arrived in St. Petersburg via Central Asia. A facsimile edition of this codex was prepared by Rezvan in 2004. The text is written in what is called the late ḥijāzī script. It was written by two copyists, A and B. In accordance with François Déroche's classification, both hands correspond to the styles B.I and B.II among the early Abbasid scripts. The style of medial jīm / ḥāʾ / khāʾ, however, largely corresponds to style A.I. On the whole the manuscript is indicative of the transition from the ḥijāzī script to later styles. As a rule alif is perpendicular to the line, although it sometimes preserves a slight incline to the right, as does the vertical stroke in tāʾ and lām. Copyist B, a more professional hand, is characterized by a rounded finish to final jīm / ḥāʾ / khāʾ, ʿayn and ghayn, which serves as a principal distinguishing characteristic from copyist A. The number of lines per page varies widely (Copyist A - 23 to 31 lines; Copyist B - 21 to 26 lines), as does the size of the letters. Diacritical marks to distinguish the consonants are consistently provided in the manuscript. For example, dots above tāʾ are set vertical to the line; dots above the thāʾ are either vertical or in a single horizontal line at a slight angle to the line of the text. Initial and medial qāf are marked both by two dots above the letter and a dot below it; the two dots could have been added possibly later by another hand. The blanks between the surahs were later filled in with ornamented illuminations, each of them an original composition of triangles and semicircles made up of parallel, interwoven and intersecting red and green lines and, in number of cases added vignettes. The basmala is treated as a separate āya throughout the text. Total number of folios: 97 = 81 (Manuscript E 20, Institute of Oriental Studies, St. Petersburg, Russia) + 1 (Call no. 11604, Collection of the Uzbekistan Academy of Sciences, Bīrūnī Institute of Oriental Studies, Tashkent, Uzbekistan) + 2 (Ibn Sīnā Bukhārā Regional Library, Bukhārā, Uzbekistan) + 12 (Mazār of the shaykhs of the ʿIshqiyya brotherhood in Katta Langar, Uzbekistan) + 1 (Library of Administration of Muslim Affairs, Tashkent, Uzbekistan). The manuscript contains about 40% of the text of the Qur'an, with full texts of 22 surahs and fragments of another 22. The sequence of the surahs correspond to rasm al-ʿUthmānī. This manuscript was falsely attributed to caliph ʿUthmān in Katta Langar[such as the one at Samarqand, two in Istanbul (Topkapi Library and TIEM), and two in Cairo (al-Hussein mosque and Dār al-Kutub)]. The table below is produced by combining Tables 1 and 14 as seen in the facsimile edition. Institute of Oriental Studies, St. Petersburg, Russia; Collection of the Uzbekistan Academy of Sciences, Bīrūnī Institute of Oriental Studies, Tashkent, Uzbekistan; Ibn Sīnā Bukhārā Regional Library, Bukhārā, Uzbekistan; Mazār of the shaykhs of the ʿIshqiyya brotherhood in Katta Langar, Uzbekistan; Library of Administration of Muslim Affairs, Tashkent, Uzbekistan). راہ سے بھٹکا ہوا انسان راہِ راست پہ آگیا! کیا فرقے الکتاب سے بنے ہیں یا صحاحِ تسع سے ! داعش کے حملے کا نیا طریقہ ! ایک قرآن فہم خاتون کا قصہ! پانامہ کیس پر سپریم کورٹ کا فیصلہ! ماں ، بچے اور مہنگائی ! خیبر پختون خواہ کا واحد مرد! ابھی کل کی تو بات ہے !